In a Russia still bathing in nostalgia for Chekhov’s novellas and the twilight romanticism of Tchaikovsky, the appearance on the musical scene of Sergei Prokofiev was a major artistic turning point. In the context of early 20th c. complacency, his music was soon to overturn many an article of faith. And in its stylistic expression, my own music is partially inspired by 20th c. Russian tradition, a legacy whose spiritual depth constantly nourishes my imagination with crucial aspects of its mysterious essence. "The impeccable piano playing of Ms. Lin shows her flair for thinking so far outside the box almost no one can keep up with her. In tackling some more classical Russian repertoire, she bookends some solid Prokofiev with recent works by a young Russian that she finds the gold in, all with just ten fingers and no outside help." 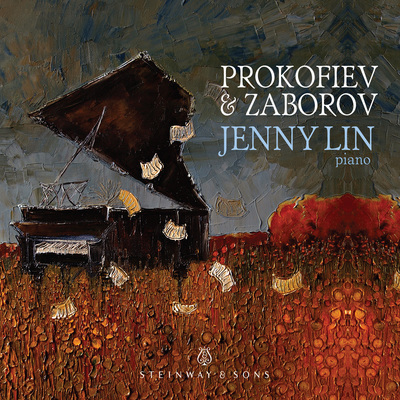 "Throughout, [Lin's] sense of color and phrasing are seductive—and she captures Prokofiev’s kaleidoscopic spirit, from the intoxication of “Cinderella Goes to the Ball” to the dense obsessiveness of “Despair” (the third of the op. 4 pieces), with consistent acuity. You’d have to go back to Richter to find a better version of Cinderella—and the Four Pieces are equally strong...Strongly recommended." 3. Variations for Piano "Quattrocento"
5. Suite for Piano "Entrelacs"